Think of the TV cartoon studios of the 1960’s and you may think of Hanna-Barbera, DePatie-Freleng, Filmation, and JKL Productions. JKL Productions? Who are they? I’m glad I asked that, for indeed that is our subject for today. JKL Productions was the name chosen by comedian Morey Amsterdam for his cartoon studio. He announced a series featuring the voice and likeness not only of himself, but Zsa Zsa Gabor as well. Our good pal Darrell Van Citters recently discovered a 16mm print of Amsterdam’s pilot episode, Black, Kloke and Dagga, among the artifacts of the late Lee Orgel, animation producer… and old pal of Morey Amsterdam. 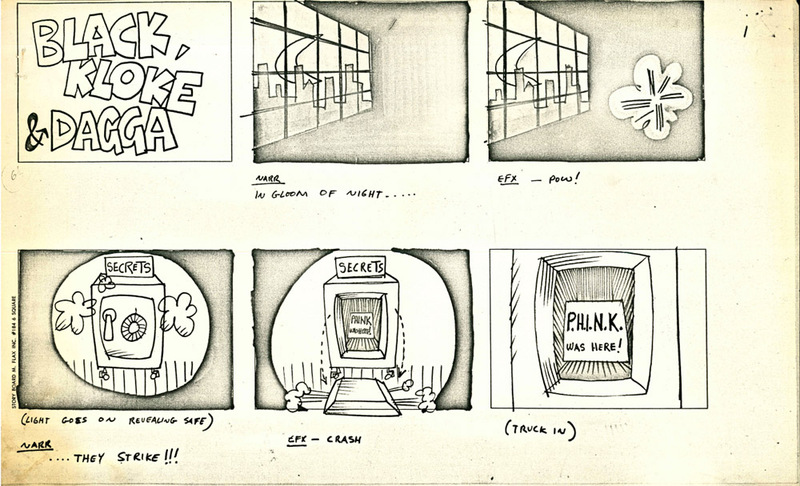 Darrell also found a complete storyboard for same. The film does in fact feature Morey and Ms. Gabor on the soundtrack, and the characters resemble them as well. Interestingly the third actor is Stan Irwin. About this same time Mr. Irwin was working as the voice of Costello in the Hanna-Barbera Abbott and Costello cartoons, and Lee Orgel’s Jomar Productions co-produced the series. 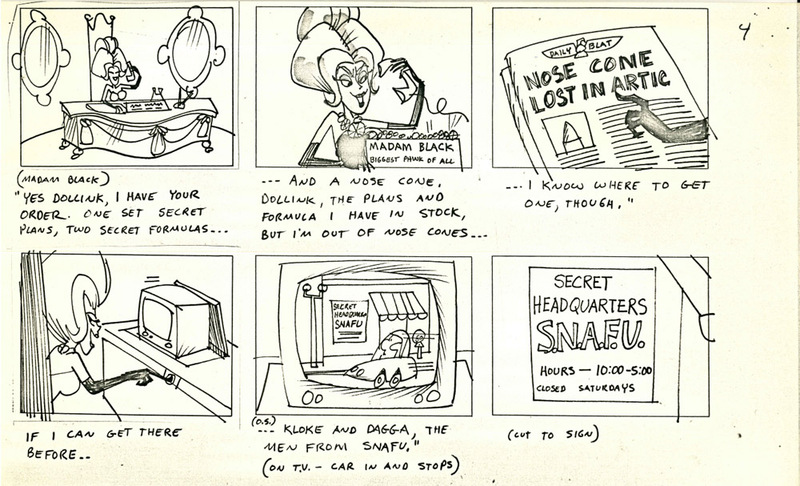 Morey Amsterdam had a few brushes with animation before this, mainly with UPA. 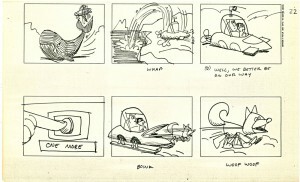 His first being a cartoon for The Boing Boing Show entitled “The Merry-Go-Round in the Jungle” designed and directed by Lew Keller. The cartoon was a fanciful telling of the Henri Rousseau story. 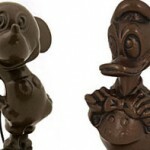 Amsterdam did the narration in a dodgy French accent similar to the one he would employ in Gay Purr-ee six years later. About the time he was recording his voices for Gay Pur-ee, Amsterdam also worked on Magoo’s Christmas Carol. These last two projects were produced Lee Orgel. Small wonder then that when Morey Amsterdam wanted to produce a cartoon pilot, he turned to Lee Orgel. It’s likely that Orgel acted as the actual producer, hiring freelance artists to complete the film. There are no screen credits besides the voices, so we have to make a few educated guesses about the personnel. The music sounds to me like Walter Greene’s work. The sound effects are from Phil Kaye. 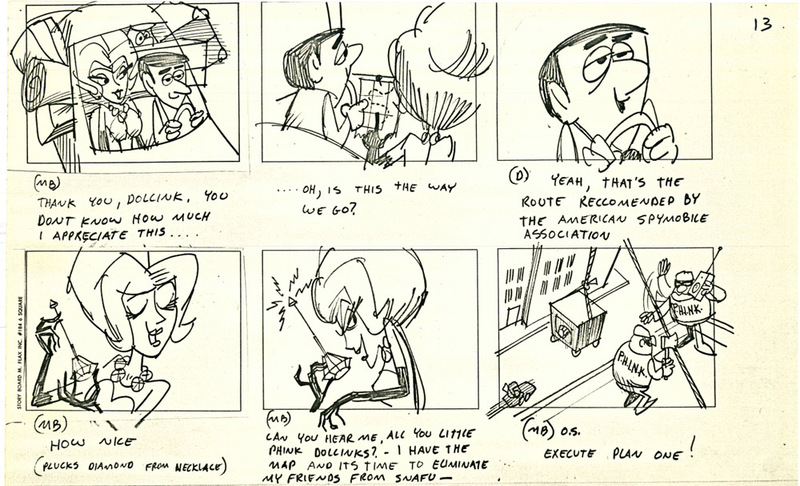 The layouts appear to be the work of Corny Cole, who probably drew the storyboard as well. 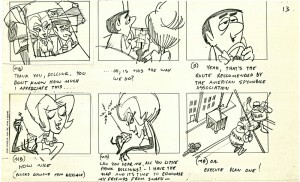 Much of the animation looks it was done in a simplified fashion by Manny Perez. The film itself is parody of the spy genre, specifically recalling the wildly popular Man from U.N.C.L.E. TV show, even employing acronyms for the spy agencies. We do not know who might have written or directed the cartoon. The print was in faded Eastmancolor, so it’s safe to assume that the colors were originally much more vivid. What possessed Morey Amsterdam to want to become an animation producer is another mystery. Perhaps it was a belated revenge plot against Hanna-Barbera for not using him as the voice of George Jetson as they had originally planned. I guess we’ll never know. We also don’t know what if anything JKL stood for, other than being three consecutive letters of the alphabet. Anyway, take a look at the cartoon and judge for yourself if this was another great could-have-been, or another mediocre understudy waiting in the wings for the big break that never came. A fun obscurity, but “mediocre” is being kind. At least the director wasn’t legally blind unlike the sole director at a certain studio that Greene did the music for. Very funny. I was being serious. “Year of the Horse” (from the clipping) was released as The Horse in the Gray Flannel Suit (1968). I neglected to mention that included with the original theatrical run of “Horse…” was – here’s your animation connection – the Winnie the Pooh and the Blustery Day featurette. Off-topic, but what is the current whereabouts for the Academy Award that “Blustery Day” won for? I was just the former Florida animation building at Disney Hollywood Studios and out of all the awards displayed for “Best Animated Short” Disney won (not counting the recent “Paperman”), “Blustery Day” was not included. Maybe Wolfgang Reitherman kept that for himself? It’s a stretch, though perhaps it’s back over at the main studios someplace. I’m thinking of asking Dave Smith about that, but I’m not sure he knows either. H-B’s version of Alice in Wonderland the previous year! I dunno… my first impression was Jay Ward-ish. Too much plot, but the jokes and references they did include were good. I’d have watched it as a kid, certainly. Even though it was unremarkable, it was fun nonetheless. 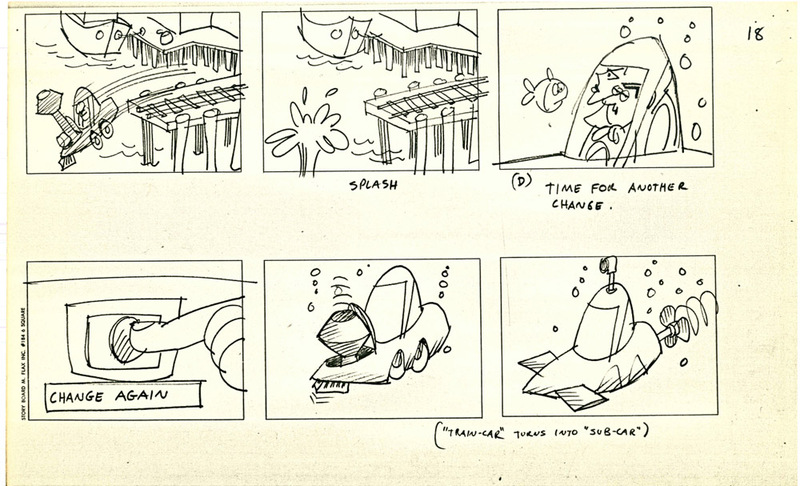 Storyboards also show this. LIked the Zsa Zsa character changing her clothes out of nowhere and scuba diving through a bullethole offscreen. Curious why it was never picked up despite the relatively famous voice cast. 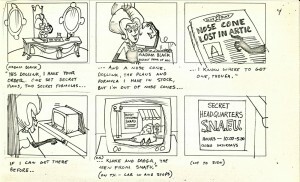 I’m guessing by ’68 cartoon spy spoofs were already saturating the market and the indie company didn’t have much of a chance to stand out. 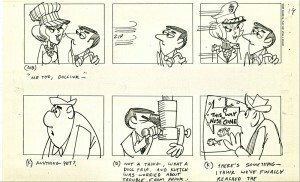 jeez… appreciate the find, but animation-wise only a 60s Popeye could be worse!!! Lord knows he had quite a few ideas that went nowhere. Just a guess, but the music sounds like Dean Elliott. I recognize some of it as nearly being used in Lantz’s Beary Family cartoons. 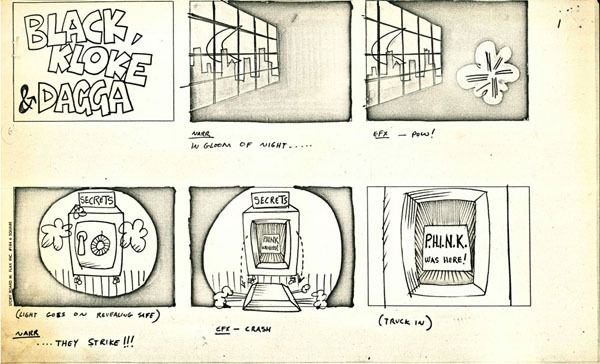 Are you sure that storyboard was drawn by Corny? Choppy cutting and the stiff down angle of the moving car at 2:55 doesn’t work on any level. The scoring does sound like any run-of-the-mill DFE short. For Morey Amsterdam, one would expect more jokes. 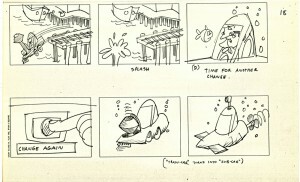 I’m not absolutely sure about the storyboard. If you recognize the style please let us know. There is very little information on this cartoon, and we’d like to fill in as many gaps as possible. Not bad at all. It actually made me laugh a few times. I could definately see this working. I liked it! 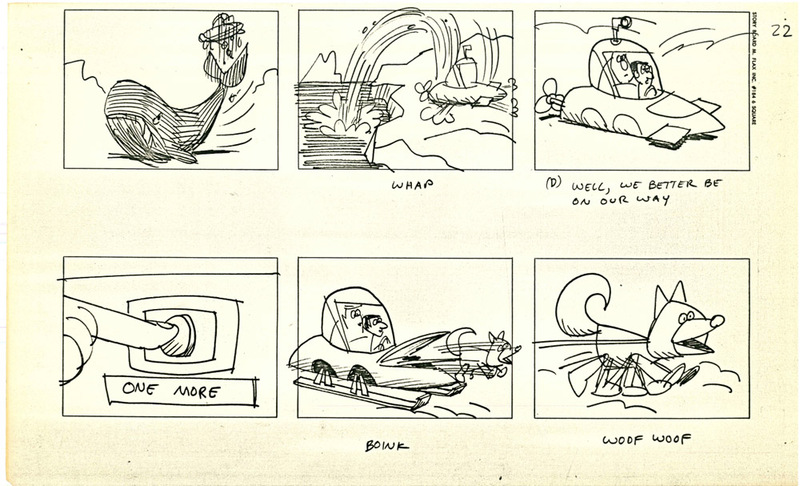 I don’t think it was Corny Cole on layout, but I do suspect it may have been someone from the “Roger Ramjet” team. For some reason they went to lengths to show “Dagga” having blue eyes (purple on this faded print) but the ink-and-painters overlooked it in some shots. Morey Amsterdam sounded like he was trying to do a Bogart-ish voice rather than his usual Noo Yawkese wise guy; and Zsa Zsa was pretty good, though Eva really had more of a knack for comedy. You’re probably right about Walter Greene on music; doesn’t sound like Dean Elliott. This show could’ve done fairly well in syndication as a segment for local station kiddie shows. Amsterdam was a pretty astute business man. If I recall correctly he was an investor in American International Pictures and did quite well. 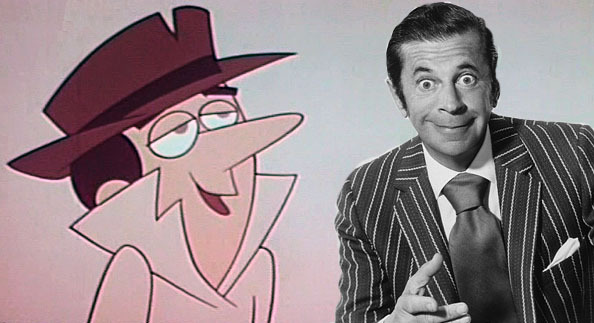 About all Variety said about the series was: “J K L Productions, with comedian Morey Amsterdam and producer Lee Orgell partnered, has a cartoon private-eye spoof ready for syndication in the kidvid market. Titled “Black Kloke & Dagga,” the initial package contains 50 five-minute segs with Amsterdam and Zsa Zsa Gabor doing all the voices.” (Dec. 20, 1967). You have to wonder how he had time for it. He seems to have been constant demand. Among other things, he produced a “Breakfast in Hawaii” daytime syndicated show being hawked around the same time. Plot holes weren’t this cartoon’s specialty! 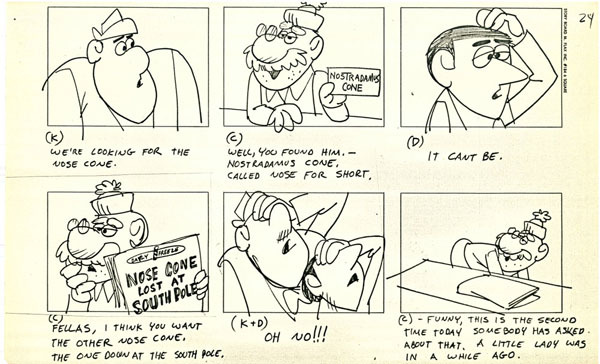 My wild guesses at who did the storyboard would be either Bob Kurtz or Sam Cornell. 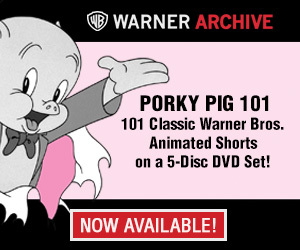 Content aside, I differ with many posters that the animation is poor, or at a “60’s Popeye” level. As far as low budget TV animation was concerned, I would say it was pretty well done for the time, more on a par with Jay Ward style and pleasant and fun enough to look at. 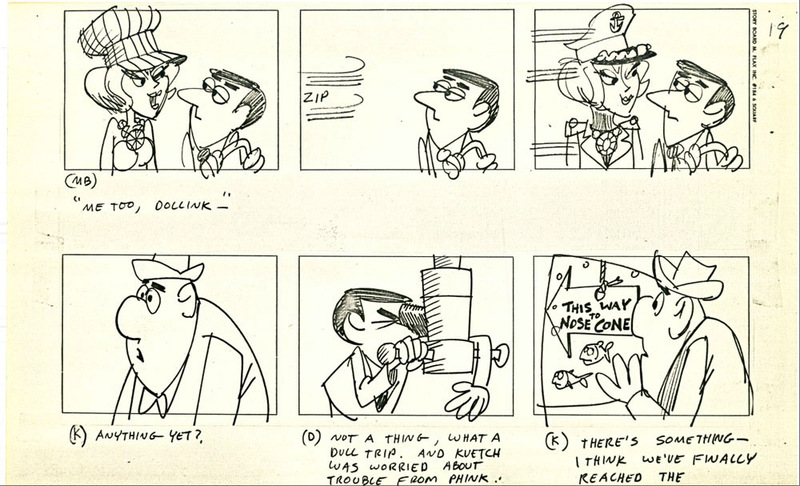 Looking at the Limited Animation Lovers Facebook page at this, I thought that this was Hanna-Barbera’s “Inch High, Private Eye” from 1973-74! The DFE comparison is apt, tho not top-tier DFE, unfortunately. The design of Morey’s character is amazingly good for how simple it is. I wouldn’t know who it’s supposed to be per se, so it’s not exactly a caricature, but it’s very good. Given more “Morey-esque” dialog it would be first rate to animate. it’s an interesting short and thanks for posting it. IMO the main fault is it lacks energy right across the board, from script, to recording to pacing, cutting and execution. The voices are all talented people but sound phoned in. The choice of doing a Bogart voice is a particular misfire considering how snappy his regular persona was. I wonder if the title was originally KLOKE & DAGGA but they had to give Ms. Gabor’s character top billing just to get her to do it?